In the context of its industrial specialisation, KDA developed specific solutions concerning photovoltaics for all types of buildings (houses, apartment blocks, industry, agriculture, small and medium-sized businesses and industries, car parks, businesses, etc….). 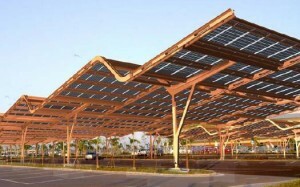 Photovoltaic projects operate within a strict legal framework. The specific features of these buildings, in particular the safety requirements of the CSS, need professional and multidisciplinary solutions. Photovoltaic sheds can house many different set-ups in agriculture, such as: animal housing, materials storerooms, fodder and hay storerooms, flat grain silos, living quarters, dairies, cheese factories, horticultural greenhouses, vegetable greenhouses, asparagus greenhouses, etc……….